Protestors carried a sign saying, “Lesbian, Gay and Bisexual: We are Already in the Church. 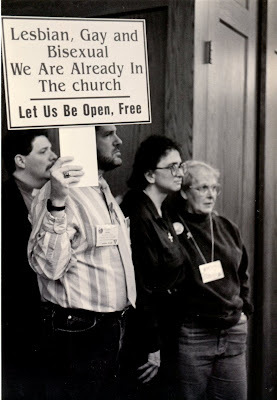 Let us be Open, Free” when the National Council of Churches denied observer status to Metropolitan Community Churches in November 1992 in Cleveland, Ohio. Pictured in the middle is Nancy Wilson of MCC. Photo by Kittredge Cherry. Happy birthday to Metropolitan Community Churches! And thanks for 44 years ministering in the LGBT community. MCC was founded 44 years ago today on Oct. 6, 1968. Photos from MCC history are posted today in honor of the occasion, and as a tribute to all queer people of faith who dare to believe that God loves us just as we are. The photos here show highlights from my own ministry in MCC during the 1990s. I had the privilege of working closely with Rev. 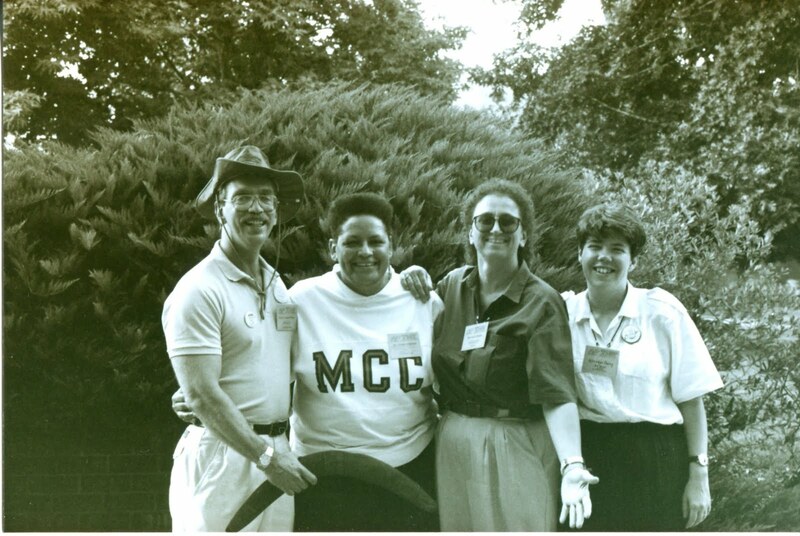 Troy Perry, the openly gay man who founded MCC. 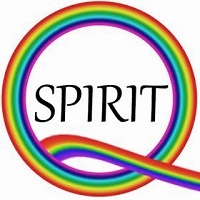 He was incredibly brave and visionary to create a church for queer people back in 1968, when homosexuality was still considered a sin, a sickness and a crime. He describes the founding and early years of MCC in the book Don't Be Afraid Anymore: The Story of Reverend Troy Perry and the Metropolitan Community Churches by Troy D. Perry and Thomas Swicegood. I joined MCC in 1985 and became an ordained minister. I served as program director at MCC San Francisco. Then I joined the denominational headquarters in Los Angeles, where I handled ecumenical and public relations, working with Troy and Rev. Nancy Wilson, who currently heads MCC as moderator. I try to post some of my historic MCC photos every year on MCC’s anniversary. This year I am sharing many of Nancy and me doing ecumenical ministry together. The photos capture just a few moments from those memorable times. We held protest signs and took over the microphones when the National Council of Churches denied observer status to MCC in Cleveland, Ohio, on Nov. 12, 1992. Nancy, pictured in the middle, seized the podium and said, “It’s easier to get into heaven than into the NCC!” She banged her fist on the podium so hard that it cracked. Protest signs in this photo say, “Stonewall Rises Again!! !” and “Lesbian, Gay and Bisexual: We are Already in the Church. 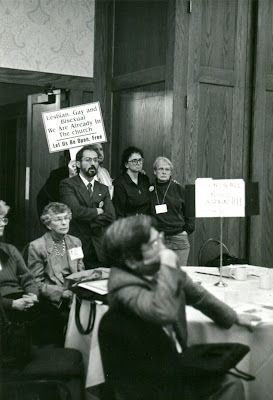 Let us be Open, Free.” Pictured are, from left, John Taktikos of Axios (Orthodox gay and lesbian group), Nancy Wilson of MCC, and Lorna Cramer of Unitarian Universalists for Lesbian/Gay Concerns. Photo by Kittredge Cherry. RIP John Taktikos, who died of AIDS in October 1993. The MCC banner is carried by Peter Trabaris and Gloria Soliz at the National Council of Churches meeting in Cleveland in Nov. 1992. 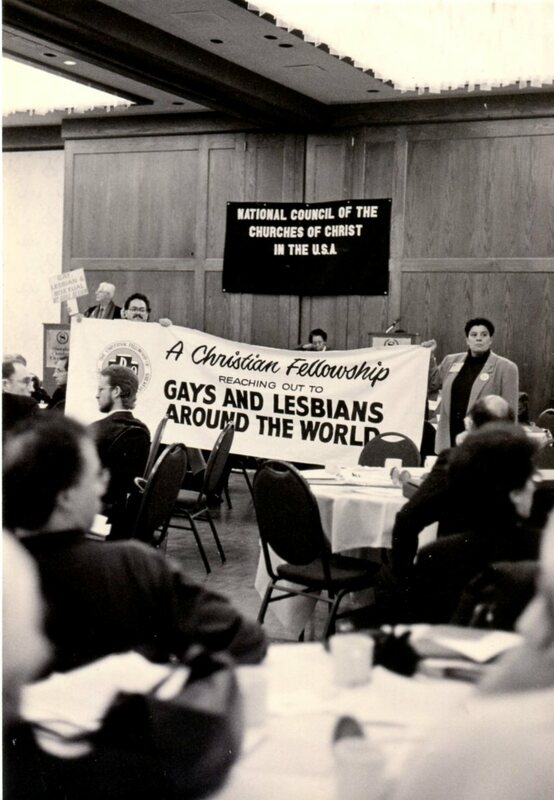 The banner has the MCC logo and the words, “A Christian fellowship reaching out the gays and lesbians around the world.” Barely visible in the background is Rev. Howard Warren of Presbyterians for Lesbian and Gay Concerns. It looks like his sign says, “Gay, lesbian and bisexual by God’s design.” The banner on the wall says, “National Council of the Churches of Christ in the USA.” Photo by Kittredge Cherry. RIP, Howard Warren, who died in 2003. Here is the NCC-MCC Dialogue Committee in November 1992 in Cleveland, Ohio. We sure look miserable. Our committee tried and failed to find common ground on homosexuality. 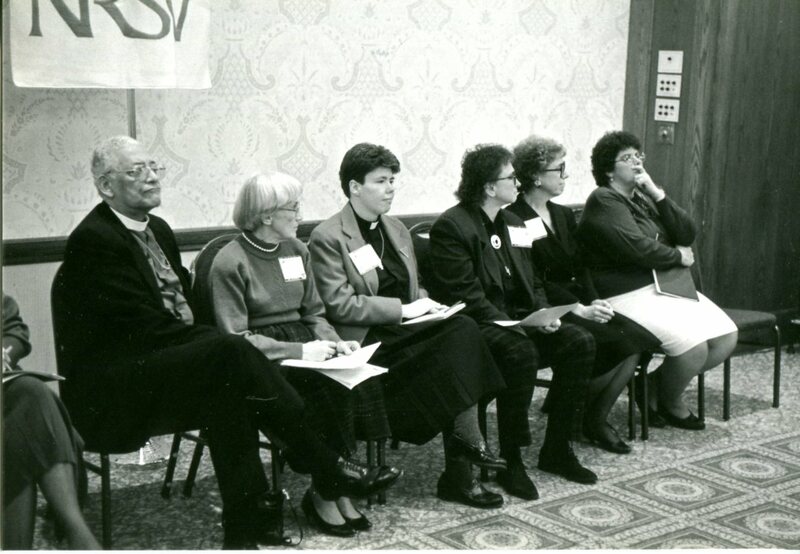 Left to right: Bishop Clinton Hoggard (African Methodist Episcopal Zion Church), Jean Marshall, Kittredge Cherry (MCC), Nancy Wilson (MCC), Laura Bailey (Disciples of Christ) and NCC staffer Eileen Lindner. Some other committee members are not pictured. RIP Bishop Hoggard, died 2002. 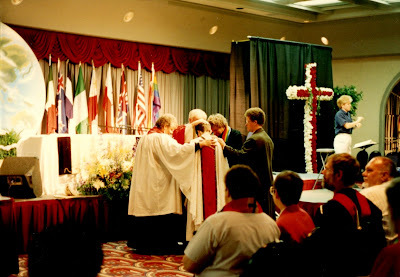 Ordination of Kittredge Cherry, July 1993 at MCC General Conference, Phoenix, Arizona. Ordination was done through laying on of hands by the elders. Elders pictured with me are, from left, Revs. Jean White, Don Eastman and Freda Smith. My life partner Audrey stands beside me on the far right. RIP Jean White, who died in 2010. 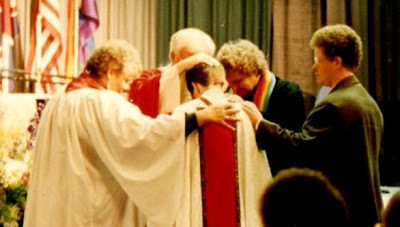 Close-up of my ordination from the photo above. 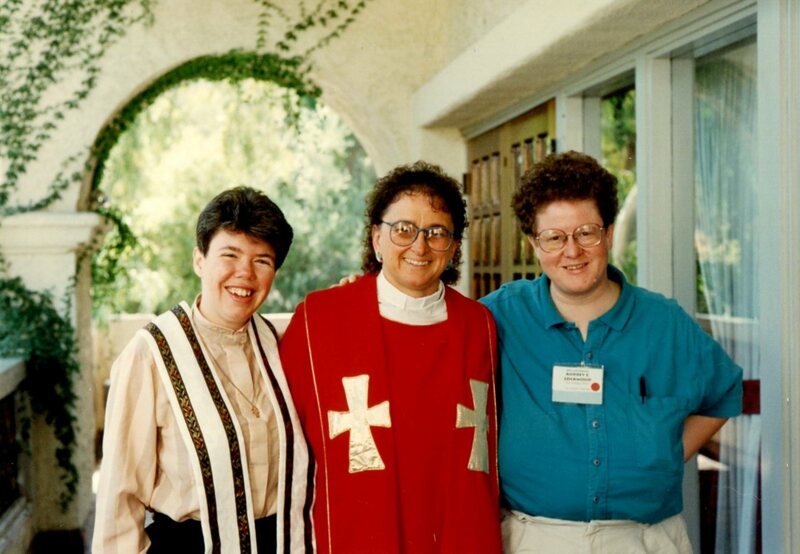 Happy times with Kittredge Cherry, Nancy Wilson, and my life partner Audrey at in July 1993 at MCC General Conference, Phoenix. I love the way the arch forms an arc over my head. 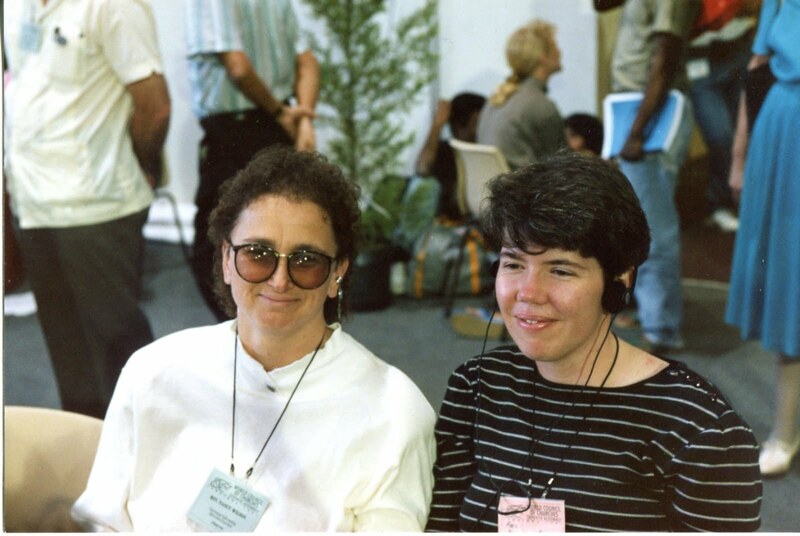 Nancy Wilson, left, and Kittredge Cherry advocated for LGBT rights at the World Council of Churches Assembly in Canberra, Australia in 1991. I’m wearing headphones to listen to the translation at the multilingual event. This was the first conference that I attended after being hired as Field Director of Ecumenical Witness and Ministry for MCC. MCC’s delegation to the World Council of Churches Assembly in Canberra, Australia in 1991 included, from left, Revs. Steve Pieters, Sandi Robinson, Nancy Wilson and Kittredge Cherry.